Israel's prime minister has announced a controversial plan to add two major religious sites in the West Bank to the country's national heritage list. Benjamin Netanyahu told his cabinet the Tomb of the Patriarchs in Hebron and Rachel's Tomb in Bethlehem would now be included in the $107m restoration plan. Israeli media said the two sites had been included on the list only after pressure from nationalist ministers. The Palestinian Authority warned the decision would "wreck" peace efforts. Negotiations between Israel and the Palestinians have been frozen for more than a year, with the PA refusing to participate until Israel halts settlement building in the West Bank and East Jerusalem. Israel has scaled back construction in the West Bank, but it does not consider areas within the Jerusalem municipality to be settlements. Addressing a cabinet meeting, Mr Netanyahu unveiled the two additions to the national heritage list. He said the Tomb of the Patriarchs and Rachel's Tomb had to be preserved because they showed Israel's ancient ties to the land. "Our existence here doesn't just depend on the might of the military or our economic and technological strength," he added. "It is anchored first and foremost in our national and emotional legacy." The Tomb of the Patriarchs - which Muslims call the al-Ibrahimi mosque - is where the Bible says Abraham, Isaac and Jacob were buried along with three of their wives. It has been a flashpoint for decades, with 500 Jewish settlers living in enclaves near the disputed site, surrounded by 170,000 Palestinians. The Tomb of Rachel - a shrine to the Biblical matriarch revered by Jews, Christians, and Muslims - has also been a source of controversy. Israel's West Bank barrier juts far into Bethlehem so that the tomb is located on the Israeli side, ostensibly for security reasons. However, Palestinians say it impedes their access and represents an illegal land grab. Jewish settlers and nationalists, who oppose giving up control of any of the West Bank, said they were pleased with Mr Netanyahu's announcement and that they would press for additional biblical sites to be added to the list. 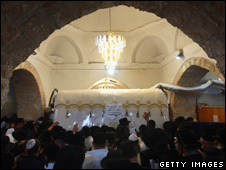 A spokesman for the Palestinian Authority condemned the decision, particularly the designation of the Tomb of the Patriarchs, and warned it could take the Israeli-Palestinian conflict in a dangerous direction. "We believe that this particular violation is very dangerous because it might add to the religious nature of the conflict," Ghassan Khatib told the Associated Press. But Israeli government spokesman Mark Regev said the list was not meant to draw borders ahead of a final status agreement. 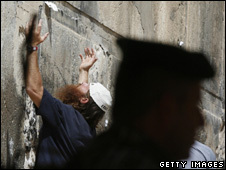 "The purpose of the list... is to single out sites that are of great importance to the Jewish people," he said. Close to 500,000 Jews live in more than 100 settlements built since Israel's 1967 occupation of the West Bank and Arab East Jerusalem. They are illegal under international law, though Israel disputes this.